Lakeside-Eline Alice Powell, 87, passed away peacefully at Bay Area Hospital on Sunday, March 31, 2019. Eline or “Yule” as she was lovingly called by her friends and family was born on January 11, 1932 in Dickinson, North Dakota to Albert and Regina (Wolf) Schaff. The family moved to Spokane where Eline was raised and eventually graduated from high school. Eline met and fell in love with Ward William Powell, they enjoyed a wonderful 67 years together. The family would eventually add six children to the union; Larry, Jeff, Jodi, Gina, Cathy and Richard; during these years the family lived in; Spokane, WA, Portland, OR, and Lakeside, OR. Eline began her working career at Safeway in September of 1963, and worked in the Variety Department for an amazing 32 years. She was the very first female manager and worked at the largest Safeway store, part or her accomplishments was starting the J-Hook program. 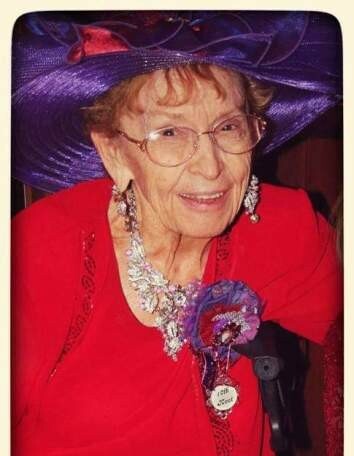 Eline loved elephants, oriental trinkets, growing her flowers, playing Dominos with her husband and friends, she ran Bunco for years and loved it, and dressing up and delivering a birthday song; she was a very giving person. She was Queen Mum of the Red Hat Club, organized various events to help people, she was especially passionate about feeding people; she did not want anyone hungry. She considered her Red Hat Ladies and her Bunco group to be her second family and in return, many of these folks considered her to be a second mom. Her family remembers her to be a person that wore many hats; she spent her life serving unselfishly; putting others needs before her own, she was an awesome wife, mother, sister, friend, aunt, and grandmother and finally an extra special person. Eline is survived by her son Larry and wife Kathy, son Jeff and wife Becky, daughter Jodi and husband Greg, daughter Gina and husband Ron, and daughter Cathy and husband Joe. She is further survived by grandchildren; Brandon, Jordan, Travis, Chelsey, Candace, Jake, Kodi. She is also survived by her great grand kids; Astin, Briawna, and Austin. She was preceded in death by; husband, Ward Powell and son Richard L. Powell and her parents Albert and Regina. Arrangements entrusted to Dunes Memorial Chapel.